'Herein Dr Barclay has gathered and expounded the New Testament titles and interpretations of Jesus. Crisp, compact, informed, the book has all the marks of Barclay at his best. As always he draws on an apparently bottomless well of relevant and useful illustrations. There is the characteristic feeling for words and care in translation and exposition' (Expository Times). 'Here are the findings of modern scholarship at its best presented in a readable and interesting manner. Some of the intricacies of textual criticism are so ingeniously handled as to ,make them intelligible to the reader with little or no theological training. Any intelligent churchgoer will benefit from these expositions of scriptural themes, for Dr Barclay neither minimizes his readers' intelligence, nor assumes hat they possess knowledge of Biblical background' (Chierch Gazette). A companion volume to The Mind of Jesus and Crucified and Crowned. Jesus as They Saw Him has been Unavailable for a number of years, and now makes a welcome reappearance. 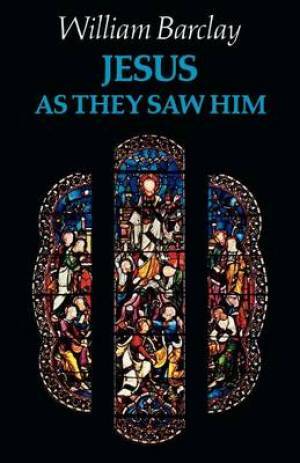 Jesus as They Saw Him by William Barclay was published by SCM Press in September 1977 and is our 47603rd best seller. The ISBN for Jesus as They Saw Him is 9780334007715. Be the first to review Jesus as They Saw Him! Got a question? No problem! Just click here to ask us about Jesus as They Saw Him.